What Is Earth Potential Rise? What Are Some Different Types of Earthing Electrodes? Earthing is the process of electrically connecting any metallic object to the earth by the way of an earth electrode system. The National Electric Code requires that the earthing electrodes be tested to ensure that they are under 25-ohms resistance-to-earth (Earth). It is important to know that aluminum electrodes are not allowed for use in earthing. The standard driven rod or copper-clad rod consists of an 8 to 10 foot length of steel with a 5 to 10-mil coating of copper. This is by far the most common earthing device used in the field today. The driven rod has been in use since the earliest days of electricity with a history dating as far back as Benjamin Franklin. Driven rods are relatively inexpensive to purchase, however ease of installation is dependent upon the type of soil and terrain where the rod is to be installed. The steel used in the manufacture of a standard driven rod tends to be relatively soft. Mushrooming can occur on both the tip of the rod, as it encounters rocks on its way down, and the end where force is being applied to drive the rod through the earth. Driving these rods can be extremely labor-intensive when rocky terrain creates problems as the tips of the rods continue to mushroom. Often, these rods will hit a rock and actually turn back around on themselves and pop back up a few feet away from the installation point. Because driven rods range in length from 8 to 10 feet, a ladder is often required to reach the top of the rod, which can become a safety issue. Many falls have resulted from personnel trying to literally ‘whack’ these rods into the earth, while hanging from a ladder, many feet in the air. The National Electric Code (NEC) requires that driven rods be a minimum of 8 feet in length and that 8 feet of length must be in direct contact with the soil. Typically, a shovel is used to dig down into the earth 18 inches before a driven rod is installed. The most common rods used by commercial and industrial contractors are 10 ft in length. Many industrial specifications require this length as a minimum. A common misconception is that the copper coating on a standard driven rod has been applied for electrical reasons. While copper is certainly a conductive material, its real purpose on the rod is to provide corrosion protection for the steel underneath. Many corrosion problems can occur because copper is not always the best choice in corrosion protection. It should be noted that galvanized driven rods have been developed to address the corrosion concerns that copper presents, and in many cases are a better choice for prolonging the life of the earthing rod and earthing systems. Generally speaking, galvanized rods are a better choice in all but high salt environments. An additional drawback of the copper-clad driven rod is that copper and steel are two dissimilar metals. When an electrical current is imposed, electrolysis will occur. 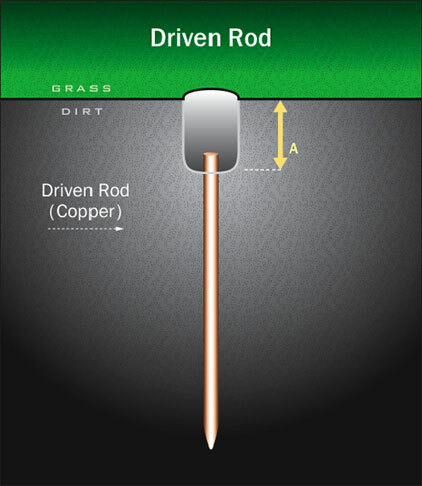 Additionally, the act of driving the rod into the soil can damage the copper cladding, allowing corrosive elements in the soil to attack the bared steel and further decrease the life expectancy of the rod. Environment, aging, temperature and moisture also easily affect driven rods, giving them a typical life expectancy of five to 15 years in good soil conditions. Driven rods also have a very small surface area, which is not always conducive to good contact with the soil. This is especially true in rocky soils, in which the rod will only make contact on the edges of the surrounding rock. A good example of this is to imagine a driven rod surrounded by large marbles. Actual contact between the marbles and the driven rod will be very small. Because of this small surface contact with the surrounding soil, the rod will increase in resistance-to-earth, lowering the conductance, and limiting its ability to handle high-current faults. Advanced Driven Rods are specially engineered variations of the standard driven rod, with several key improvements. Because they present lower physical resistance, advanced rods can now go into terrain where only large drill-rigs could install before and can quickly be installed in less demanding environments. The modular design of these rods can reduce safety-related accidents during installation. Larger surface areas can improve electrical conductance between the soil and the electrode. Of particular interest is that Advanced Driven Rods can easily be installed to depths of 20 ft or more, depending upon soil conditions. 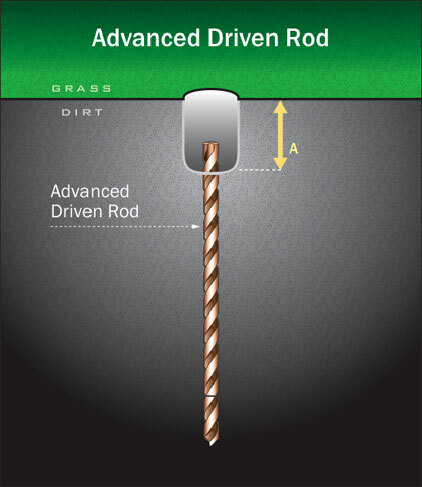 Advanced Driven Rods are typically driven into the earth with a standard drill hammer. This automation dramatically reduces the time required for installation. The tip of an Advanced Driven Rod is typically made of carbide and works in a similar manner to a masonry drill bit, allowing the rod to bore through rock with relative ease. Advanced Driven Rods are modular in nature and are designed in five foot lengths. They have permanent and irreversible connections that enable an operator to install them safely, while standing on the earth. Typically, a shovel is used to dig down into the earth 18 inches before the Advanced Driven Rod is installed. The Advanced Driven Rod falls into the same category as a driven rod and satisfies the same codes and regulations. In the extreme northern and southern climates of the planet, frost-heave is a major concern. As frost sets in every winter, unsecured objects buried in the earth tend to be pushed up and out of the earth. Driven earthing rods are particularly susceptible. Anchor plates are sometimes welded to the bottom of the rods to prevent them from being pushed up and out of the earth by frost-heave. This however requires that a hole be augured into the earth in order to get the anchor plate into the earth, which can dramatically increase installation costs. Advanced Driven Rods do not suffer from frost-heave issues and can be installed easily in extreme climes. 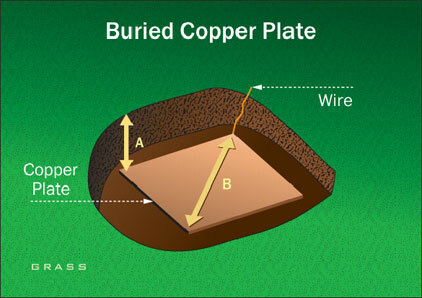 Earthing plates are typically thin copper plates buried in direct contact with the earth. The National Electric Code requires that earth plates have at least 2 ft2 of surface area exposed to the surrounding soil. Ferrous materials must be at least .20 inches thick, while non-ferrous materials (copper) need only be .060 inches thick. Earthing plates are typically placed under poles or supplementing counterpoises. As shown, earthing plates should be buried at least 30 inches below grade level. While the surface area of earthing plates is greatly increased over that of a driven rod, the zone of influence is relatively small as shown in “B”. The zone of influence of a earthing plate can be as small as 17 inches. This ultra-small zone of influence typically causes earthing plates to have a higher resistance reading than other electrodes of similar mass. Similar environmental conditions that lead to the failure of the driven rod also plague the earthing plate, such as corrosion, aging, temperature, and moisture. Originally, Ufer earths were copper electrodes encased in the concrete surrounding ammunition bunkers. In today’s terminology, Ufer earths consist of any concrete-encased electrode, such as the rebar in a building foundation, when used for earthing, or a wire or wire mesh in concrete. The National Electric Code requires that Concrete Encased Electrodes use a minimum No. 4 AWG copper wire at least 20 feet in length and encased in at least 2 inches of concrete. The advantages of concrete encased electrodes are that they dramatically increase the surface area and degree of contact with the surrounding soil. However, the zone of influence is not increased, therefore the resistance to earth is typically only slightly lower than the wire would be without the concrete. Concrete encased electrodes also have some significant disadvantages. When an electrical fault occurs, the electric current must flow through the concrete into the earth. Concrete, by nature retains a lot of water, which rises in temperature as the electricity flows through the concrete. If the extent of the electrode is not sufficiently great for the total current flowing, the boiling point of the water may be reached, resulting in an explosive conversion of water into steam. 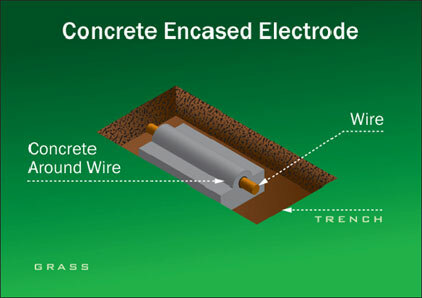 Many concrete encased electrodes have been destroyed after receiving relatively small electrical faults. Once the concrete cracks apart and falls away from the conductor, the concrete pieces act as a shield preventing the copper wire from contacting the surrounding soil, resulting in a dramatic increase in the resistance-to-earth of the electrode. There are many new products available on the market designed to improve concrete encased electrodes. The most common are modified concrete products that incorporate conductive materials into the cement mix, usually carbon. The advantage of these products is that they are fairly effective in reducing the resistivity of the concrete, thus lowering the resistance-to-earth of the electrode encased. The most significant improvement of these new products is in reducing heat buildup in the concrete during fault conditions, which can lower the chances that steam will destroy the concrete encased electrode. However some disadvantages are still evident. Again, these products do not increase the zone-of-influence and as such the resistance-to-earth of the concrete encased electrode is only slightly better than what a bare copper wire or driven rod would be in the earth. Also a primary concern regarding enhanced earthing concretes is the use of carbon in the mix. Carbon and copper are of different nobilities and will sacrificially corrode each other over time. Many of these products claim to have buffer materials designed to reduce the accelerated corrosion of the copper caused by the addition of carbon into the mix. However, few independent long-term studies are being conducted to test these claims. 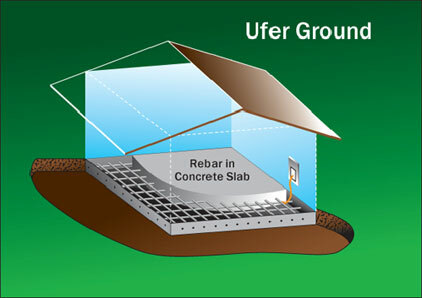 Ufer Earthing or building foundations may be used provided that the concrete is in direct contact with the earth (no plastic moisture barriers), that rebar is at least 0.500 inches in diameter and that there is a direct metallic connection from the service earth to the rebar buried inside the concrete. This concept is based on the conductivity of the concrete and the large surface area, which will usually provide an earthing system that, can handle very high current loads. The primary drawback occurs during fault conditions, if the fault current is too great compared with the area of the rebar system, when moisture in the concrete superheats and rapidly expands, cracking the surrounding concrete and the threatening the integrity of the building foundation. Another drawback to the Ufer earth is they are not testable under normal circumstances as isolating the concrete slab in order to properly perform resistance-to-earth testing is nearly impossible. The metal frame of a building may also be used as an earthing point, provided that the building foundation meets the above requirements, and is commonly used in high-rise buildings. It should be noted that many owners of these high-rise buildings are banning this practice and insisting that tenants run earth wires all the way back to the secondary service locations on each floor. The owners will have already run earth wires from the secondary services back to the primary service locations and installed dedicated earthing systems at these service locations. The goal is to avoid the flow of stray currents, which can interfere with the operation of sensitive electronic equipment. The National Electric Code requires that water pipes be bonded to earth, even if water pipes are not used as part of the earthing system. The electrolytic electrode was specifically engineered to eliminate the drawbacks of other earthing electrodes. This active earthing electrode consists of a hollow copper shaft filled with natural earth salts and desiccants whose hygroscopic nature draws moisture from the air. 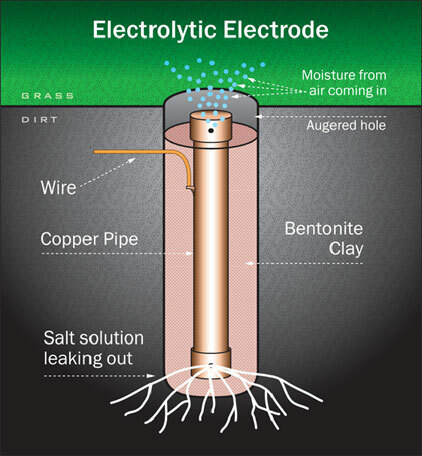 The moisture mixes with the salts to form an electrolytic solution that continuously seeps into the surrounding backfill material, keeping it moist and high in ionic content. The electrolytic electrode is installed into an augured hole and backfilled with a special highly conductive product. This specialty product should protect the electrode from corrosion and improve its conductivity. The electrolytic solution and the special backfill material work together to provide a solid connection between the electrode and the surrounding soil that is free from the effects of temperature, environment, and corrosion. This active electrode is the only earthing electrode that improves with age. All other electrode types will have a rapidly increasing resistance-to-earth as the season’s change and the years pass. The drawbacks to these electrodes are the cost of installation and the cost of the electrode itself. The following chart compares the various types of electrodes versus some important characteristics that may prove helpful in selecting proper electrode usage. * High-current discharges can damage foundations when water in the concrete is rapidly converted into steam. ** When part of extensive, bare, metallic, electrically continuous water system. Our engineering manager David Stockin is the author of McGraw-Hills Guide to UK Wiring Standards for Earthing & Bonding which is a complete guide to the earthing and bonding requirements of the latest IET codes. Download our free White Paper which covers the features and benefits of many different earthing electrodes, the importance of soil resistivity and much more. Download our free article which covers 7 common electrical earthing design mistakes. Download our free White Paper which covers Earth Potential Rise Studies and Soil Resistivity testing and much more. Have a question about electrical earthing? Visit our blog and submit a question. We are the premier electrical earthing and electrical safety consulting firm worldwide. Contact us for a consultation on your project. © 2018 E&S Earthing Solutions. All Rights Reserved.